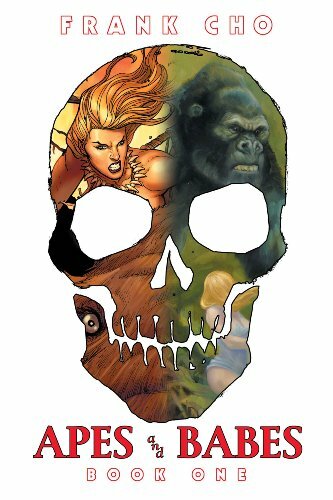 Apes and Babes should be the first art book of Frank Cho feature more of his action and superhero comic art. It's a 144-page hardcover with a dust jacket. The book features comic covers he has drawn for Marvel, Jungle Girl, Liberty Meadows and Mars. I'm not sure what Mars is but it's something like Conan, Xena, Frank Frazetta kind of art. For many of the illustrations, he has included the pencil line art version so you can see the before and after. Even though the subject is similar, the feel of the art is very different when colours are added on. The most impressive part about is art book is probably his knowledge of anatomy. Even though the characters might still be a bit stylised, the anatomy adds a more realistic dimensionality to the character designs. I like the way he uses extremely thin lines to portray muscle contours. The colouring — in this case probably called lighting — is fantastic. This book is recommended to superhero art collectors and Frank Cho fans. Its funny, I just bought this at Birmingham Comic Con this weekend. Its amazing!!!! Reminds me I need more Liberty Meadows!